For the first time in history you can put a poster with your favorite game on your wall. It uses the famous Rambo kill'em all dude from the frontpage. You can take a look at it here. Do you want this in your room NOW? 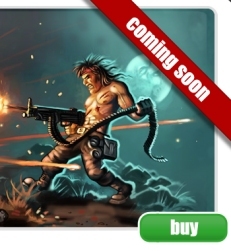 Thanks to the guys at gameposter.net you can now preorder your SOLDAT POSTER for only 9.99EU. The regular price will be 14.95EU. You've got only about 21 days to do this (this is until the posters get printed). GamePoster is a new German based company that licenses, produces and sells high quality game posters to gamers. Once you preorder they will print your poster, roll it and foil-wrap it. They guarantee the highest quality print and packaging delivered at your door step. So don't hesitate, I know you want it.